Renowned for its German build quality, Bosch is one of the best-known freezer names in the UK. Mixing cutting-edge technology with unbeatable energy ratings, Bosch freezers deliver clever, frost-free freezing while saving on energy bills. Available in freestanding, integrated, under-counter and chest freezer options, there's a stylish Bosch freezer to suit every home. With fantastic build quality and reliability, Bosch freezers also boast an army of tech to keep your food fresher for longer with ease. Its NoFrost innovation means you'll never have to defrost again. This ingenious air-circulating system takes the humidity in the air out of the freezer area and into an evaporation dish. The result? Ice stops forming, so you save time and effort and avoid the mess and hassle of defrosting. TouchControl operation gives you convenient temperature control via easy-to-read sensor fields. Temperature alarms alert you when temperature rises in the freezer compartment. VarioZone cools very efficiently and provides more flexibility inside the appliance, while flexible shelving allows you to create the space you need. Digital displays and temperature alarms make it easy to maintain the temperatures you want, and with energy ratings of a minimum of A+, the Bosch freezer range helps you save on energy costs too. Bosch chest freezers have a massive capacity, and in addition to providing lots of space, they also offer extra security for the food stored. 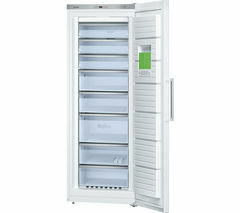 If there is a fault, such as a power cut, the contents of your freezer will stay frozen for up to 60 hours. Whether you store a little or a lot - Bosch has a freezer for every household, and capacities to suit every need. Available in a range of sizes and finishes - including classic white, bold and smart black, sleek stainless steel, striking cast iron, it's easy to find the perfect match for your kitchen. 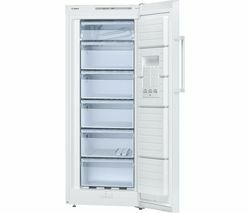 For a wider selection of finishes, sizes and prices, take a look at our full freezer range, which includes the latest Hotpoint fridge freezers and Swan fridge freezers.